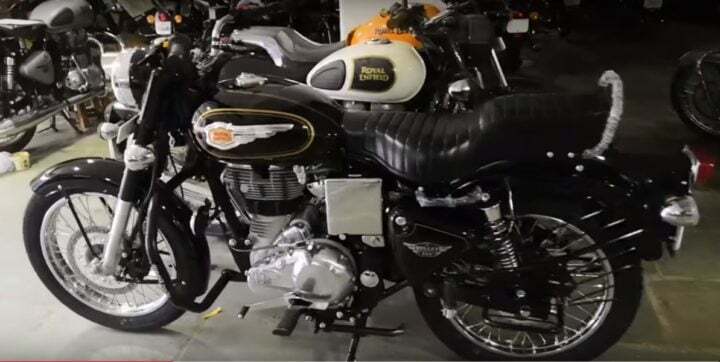 Now, Royal Enfield Bullet 350 also gets a rear disc brake. The rear disc variant comes at a price of Rs 1.28 Lakhs (ex-showroom). It does not get an optional ABS feature. Royal Enfield has started updating its bikes to meet up with upcoming safety norms. Classic 500 and Himalayan have already received ABS safety feature. The first one to receive was the Classic Signals 350. However, the Classic 350 and Bullet series came with a front disc brake only. Recently, Royal Enfield launched the rear disc brake across all variants of Classic 350. Now, it has been introduced in Bullet 350 too. The prices start at Rs 1.28 Lakhs (ex-showroom prices), which goes up to Rs 1.54 Lakhs on-road. Royal Enfield Bullet 350 now comes with a 280mm front disc brake and a 240mm rear disc brake. Although it is not announced officially, an IAB reader found it out at a dealership. He has also done a walkaround video of the same. Barring the new swingarm suspension and addition of a rear disc brake, everything else remains pretty same. Bullet 350 is one of the oldest serving bikes in their lineup. The STD variant came without any disc brake, but the Electric Start variant came with one. Despite getting upgraded with modern features, the Bullet 350 remains true to its retro roots. Royal Enfield Bullet 350 comes with a 346cc air-cooled engine that puts out 19.8 BHP and 28 Nm of peak torque. For transmission duties, it uses a 5-speed gearbox. The approximated mileage is around 35 kmpl. IT gets a fuel tank capacity of 13.5 Litres, delivering a riding range of around 450 kms on a full tank. The bike weighs 183 kgs, making it one of the heavyweights in Royal Enfield. For suspension, it uses telescopic forks in the front and twin gas-charged spring-loaded shock absorbers at the back. The disc brakes have been introduced now, but ABS is still left. It will debut on this soon before April 2020. As per upcoming safety norms, every two-wheeler above 125cc should be equipped with ABS. Bullet 350 comes in two variants – STD and Electric Start. The Standard variant is the entry-level RE model, which comes only in Black colour. The ES model comes in three colour options – Black, Silver and Maroon. Both the bikes get enormous amounts of chrome inserts over the body. As of now, Bullet Series, Classic 350 and Thunderbird series are yet to get ABS feature. All of these bikes, now feature a rear disc brake. However, before the safety norms, all Royal Enfield bikes will sport ABS. Here is the walkaround video of Royal Enfield Standard 350.